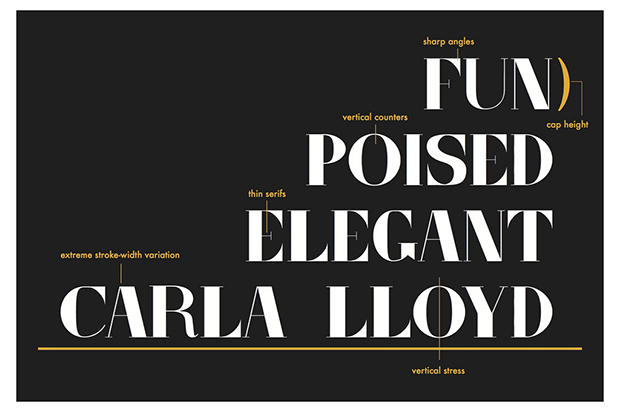 Newhouse junior Paula Hughes designed this typeface using Professor Carla Lloyd as her muse. The display cases in the lobby of Newhouse 1 currently contain work like nothing you’ve ever seen. The exhibit is a series of newly created typefaces inspired by the pillars of the Newhouse School: professors. Adjunct professor Claudia Strong started teaching the class last year and decided it was important for students to design their own typefaces from scratch, so she developed the project. The students have been working on the project all semester. After selecting their muse, each student interviewed the professor and sat in on his or her class. Strong asked the students for adjectives for the professor that would then manifest in a typeface. Each student sketched the typeface first and then designed it on the computer in the fourth week of class. The students are still developing the digital typefaces. Before putting the typefaces onto the computer, the class heard from guest speaker Tyler Finck, a graphic designer who created the open source font Ostrich Sans. Strong says the project was a long, intensive process for the students, but the majority were pleased with the result, especially after seeing the exhibit go up. The professors, she added, have been thrilled with the typeface creation since the start. “It looks pretty close to what I probably would’ve done if I was doing it on my own, though I don’t have the typeface chops to pull that off,” says assistant magazine professor Corey Takahashi of his typeface. As part of the final project, students will provide the professor with the usable typeface. Associate professor Tula Goenka also inspired a typeface. She says she may use the typeface to help promote the screening event for one of her capstone classes. Professor Lawrence Mason also says he hopes to use his typeface. In light of the positive reaction to the exhibit, Strong says she hopes to continue it in the future. Story by Claire Moran, a sophomore broadcast and digital journalism major at the Newhouse School.